Scalloped Tray. 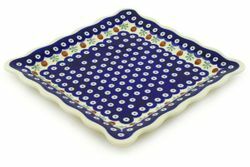 Handcrafted from durable glazed stoneware, our Polish Pottery Scalloped Tray is perfect for everyday dining and casual entertaining . Made in Poland, this heavy high-fired serving tray features attractive scalloped edges. Microwave and dishwasher safe, this stoneware Scalloped Tray will never discolor or become scratched from knives or serving utensils. This is a beautiful tray which adds instant polish to your table. Perfect for entertaining, the tray makes a wonderful hostess gift.